Ben’s a Pacific Beach local to the nth degree. In the WW-I era, Ben’s grandfather supervised the railroad tracks from San Diego to Arizona. With his family in PB since the 1920s, Ben was born, raised, and still lives in the same house. The extended family’s now as far away as Arizona, Ohio, Tennessee, Arkansas, Washington, and Northern California. Energetic and good-natured, Ben has over 30 years’ experience taking charge of restaurants. At age 15, Ben began as a dishwasher at the old World Famous on Thomas Ave. Learning from those around him, by age 19 Ben was the kitchen manager in charge of ordering, scheduling, and costing. 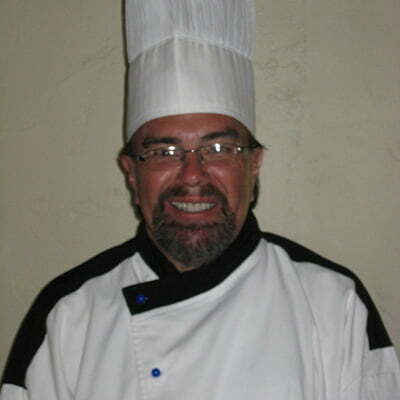 After studying Culinary/Hotel /Motel Management at Mesa College, Ben served as Executive Chef for Lotsa Pasta, World Famous, Paradise Lounge and Grill, and worked at the UCSD Medical Center as the Aramark Production/Retail/Catering manager. After years of high level responsibilities, a change of pace is in the air. These days Ben’s available to cook and cater for family and friends, including themed parties. For his parent’s 50th wedding anniversary, Ben catered for 400 people! Recently, he’s served as caregiver/chef/personal assistant extraordinaire for a double knee surgery patient with expanded activities such as tending the vegetable and herb garden, doing accessible house adaptations, and so forth. In his spare time, Ben especially enjoys a light Mediterranean meal shared with friends in rambling conversation about life and politics, ending with a siesta. Another pastime is reading about chefs working in faraway places like Bali. Ben can talk sauces ‘till the cows come home. Thank you, Chef Ben, for joining our team.